Riflessi: Console There are 13 products. 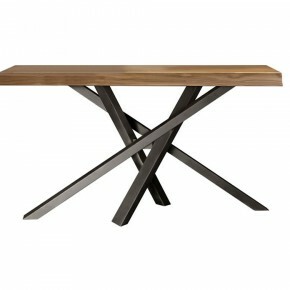 This modern console table has a rectangular oak wood top supported by satin steel scalloped legs. Luxury console table adds a chic touch to any contemporary interior. Available as standard with a white top. Simple and elegant, the Saphiria bent glass console table features an additional storage shelf. It is durable and blends seamlessly into any decor. Made from high quality tempered glass, this console table is low maintenance and fits even into confined spaces. This stylish convertible table can be easily transformed from a console table into a full size dining table due to its clever extension mechanism. This extendable table has a wood frame with a scratch resistant frosted glass top and wooden extension leaves which can be easily stored away in the special storage bag.Available in white as standard.